Photos courtesy of Bees and Bones. Our linen obsession at vitruvi HQ reached an all-time high during the summer. We’re happy to report that it’s still going strong into the colder months—proof that despite what you may have been told, linen really does have life long after August. What is one of our absolute favourite linen brands, you may ask? Bees and Bones. It has won over our hearts and we can’t hide it. Walk into our office and you’ll catch a good number of us in handmade pieces from this fellow Canadian brand. 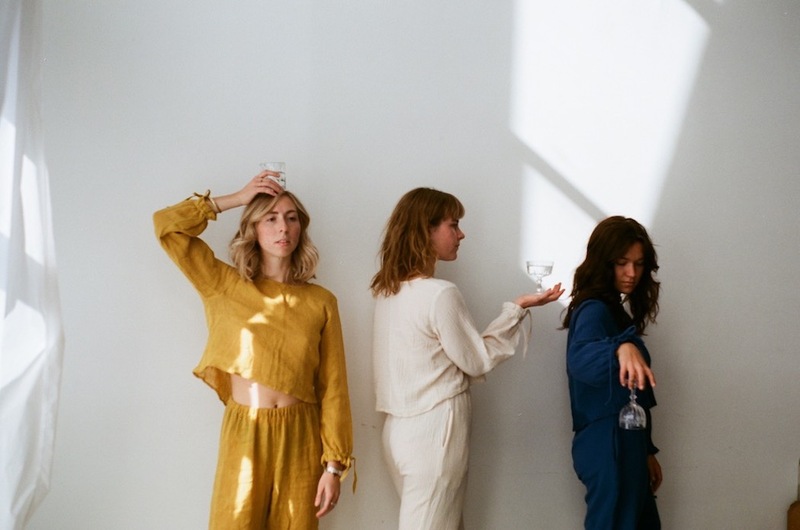 Alongside creating the most elegant (yet still extremely functional) handmade clothing items, the company sets an ethereal mood through its content that makes taking a deep dive into the world of Bees and Bones hard to resist. We reached out via email to Vancouver Island-based Brooke De Armond, the talented founder of the brand, to gain a deeper understanding of how she creates this magical world of hers. You’re such a talented designer and clothing creator—each piece is crafted with such beautiful care. 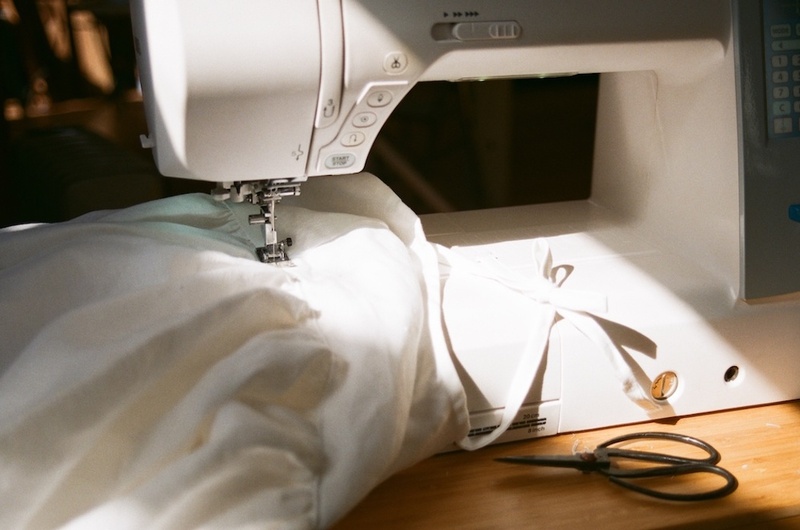 How and why did you learn to sew? My mom sewed when she was young and also made some rad little pieces of clothing for my sisters and I when we were young. I remember going to the fabric store and that exciting, overwhelming feeling of picking any fabric and then having Mom make it into clothing for us. The individuality of having clothing made in the exact colour or fabric you want seems like the truest expression of style. I also grew up dancing and started sewing sequins onto costumes and ribbons onto pointe shoes from a very young age. One of the teachers at the school is an incredible costume designer and I was mesmerized by the creating process and the fittings, the fabrics and styles that always suited the dance so perfectly. After high school I moved to San Francisco to dance professionally and when that ended a year later because of an injury, I needed a new outlet for expression. Mom’s old sewing machine came out, and I bought some fabric, started cutting, started sewing, and started wearing my (first few very poorly-made) clothes. Through a lot of trial and error, I started my collection. We love that you put an emphasis on natural fibres. What draws you to them? How do you source your fabrics? Just like using whole foods in meals or building furniture for your home, that connection between the earth and making what you need with products naturally available feels so practical. Humans have created cloth from plants and animals for so many years, and that cloth has held its purpose and then simply slipped back to the earth. Clothing, by nature, is not going to last. It will fall out of trend, the fabric will rip, you will grow out of it. So when its function is no longer, clothing made of natural fibres will just disintegrate. Also, there’s so much magic in a material that can vary from a delicate gauze, to thick ropey textures or buttery folds, all from the same plant. The most incredible fabric I’ve ever used was woven by friends of mine (Heather Dewey and Suzuna Nagamine of Woven Wares), but the reality of finding fabrics made in such small, carefully-made batches is incredibly expensive and not attainable if I want my clothing to be available to many different demographics. My plan (hopefully in the not-so-distant future!) for fabric sourcing is to travel to small mills and work with them to create the fabrics for my collections. When did you decide to take the leap and go full-time with Bees and Bones? About a year after I started B+B, my boyfriend had the opportunity to attend a log and timber frame building school for a few months on Gabriola Island. I jumped at the idea of setting up a little studio on a quiet island for the summer, testing out slower living and fully investing myself in my little business. The slower pace and solitary space gave way to all this time and creativity, and somehow new orders and new business filled up my days pretty quickly. It was a natural shift; we ended up staying for just under a year and my business grew so much in those months. Where do the names of your pieces come from? I like to read and I like words, I listen to the radio or music or eloquent friends (or people chatting in a coffee shops), and every so often a word catches my eye and I quickly write it down in a little list I keep. Words, like clothing, have a cadence and personality. I’m picky about the words—visually, the letters have to look good together, and the sounds have to match the character of the clothing. When I make a new piece there’s a vibe I want it to emit, and a name has a powerful way of expressing that. We hear you’re a one-woman business (wow)—how do you do it all? I like to think I’m very independent, definitely stubborn; I’m content being in my head and working through things on my own. And that works well for a while when your business is very task-oriented. I’ll put on a podcast, a playlist, or a TV show and putter around my studio cutting, sewing, ironing, and working through my to-do list. But running a business is so much outreach—asking questions, asking for help, needing help, needing answers to things I have to admit I don’t know and overwhelm me. I’m good at taking time to detach from work if I’m not in the right headspace, but sometimes that’s a bit of a fault when I have a lot to do and the stress of that to-do list is what’s shaking my focus. The last six months I’ve been going through some growing pains, though. There is too much to do and too little time for it all, so I enlisted the help of a few friends to help with some admin, cutting out ], and some sewing, and they’ve become invaluable honeybees to B+B. 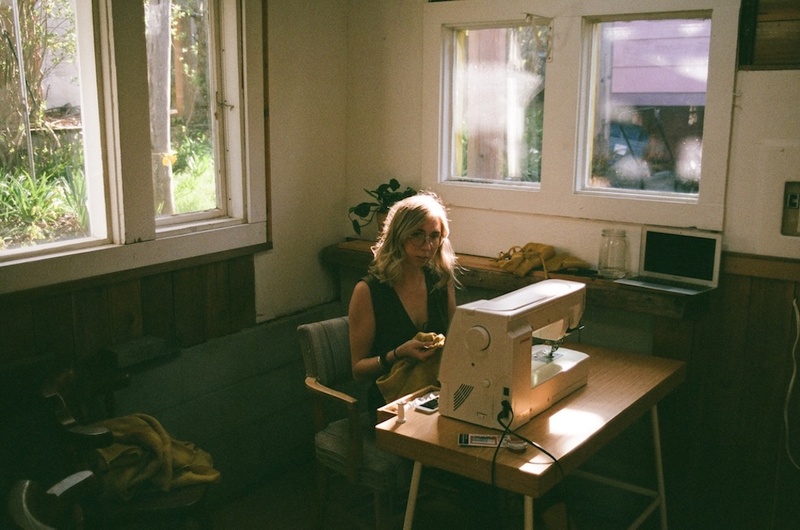 Running a handmade clothing company undoubtedly keeps you quite busy. What do you do to unwind? Hit the road and lay in the sun or cozy up in a tent with a book and that crisp west coast air. I started dancing again this past month, which has felt incredible. To be back in a space that allows for physicality—and physicality in an expressive way—is such a needed release. I’ve been trying to find alternatives to scrolling away on my phone, so I usually have a puzzle set up on my table at home and a crossword puzzle or book in my bag at at all times. Always reminding myself to be content where I am and enjoy the process—that’s a relaxing mantra.